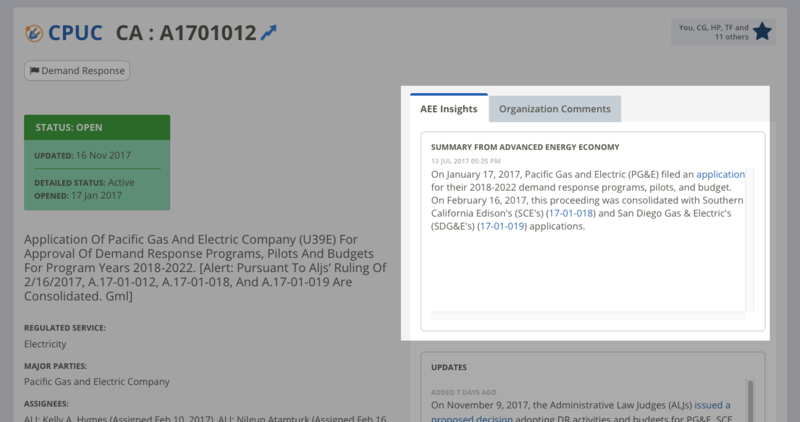 What is an "AEE Insight"? We cover hundreds of legislative and regulatory issues across the a country with expert insights from our policy team. These are written in a summary and update format and added to our platform on a daily basis. For any issue that we cover, the goal of our summaries are to get you up to speed quickly without having to read through thousands of pages of filings are multiple bill versions. They are usually 1-3 paragraphs long and focus on the top level of issues. For key issues, we also provide on-going "updates". These tend to be forward looking to let you know about an upcoming public hearing or comment period, a report publication date or some other major development. They appear below the summary section. In addition to sharing the insights directly inside of PowerSuite, we also rollup all of our "AEE Insights" every two weeks and share them as an email newsletter. Regulatory insights are published in DocketDigest and legislative in BillDigest. You can update your subscription preferences for either newsletter here.